As much as I love my closet staples that are workhorses year-round. Sometimes I just want something cute to grab & go. Enter Sugar Love Boutique. This adorable shop is filled with pretty, fun & of the moment pieces that you will want to wear right now. 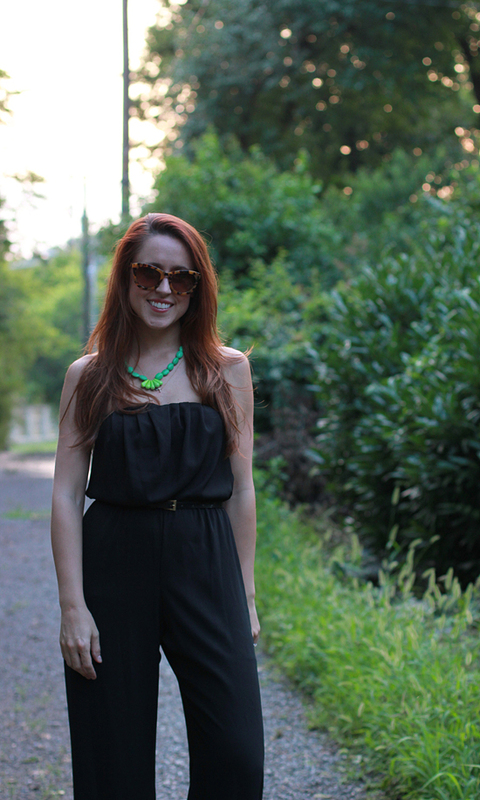 I was overjoyed to find this chic jumpsuit in my mailbox from Sugar Love. This bad boy is going to be hanging in the front of my closet all Summer, for all those times I need to be out the door in 5 minutes but still want to be cute & cool! And Sugar Love is definitely sharing the LOVE today! but everyone can take 30% off their order with code "HEREANDNOW"! The sullivan maxi dress is AWESOME! I love the georgia dress! I love the pearl dress in cream! You look absolutely amazing in this jumpsuit! Loving the Flower Power Maxi! SO cute! I like the California Dreaming and Bohemian Rhapsody dresses! Love the lucy chevron top! And you are rockin' this jumpsuit girl :) Have a great weekend! You look so chic in this jumpsuit! If I won, I think I'd pick the dakota dress! Love the anchor tank top! i love the savanna dress! or any of the maxi dresses! This jumpsuit is amazing! I have been looking for the perfect one and I think this is it! i really love the reese dress! Anchor away tank top, my favorite!!! Love the anchors away tank top! Love the Mint Chocolate Chip Maxi! I love the vintage rose top! Loving the anchors away top..thanks for the chance to win! Mine is the Dakota dress. I just love the way it looks! This looks adorable on you!! Love this closet staple! I love the chloe peplum dress. I'm digging the Rio maxi dress! So cute. Love the Alxandra tunic top! That's literally the perfect summery jumpsuit -- love it! One of my faves has to be the Delaney Maxi Dress, perfect for so many occasions! You look great in that jumpsuit! I don't know how I overlooked this on their website! Happy Friday! I love the caroline chevron top in black from the site. The Bailey Peplum Top in Neon Pink is cute! I love the Chloe Peplum dress. So cute! You are totally rocking this jumpsuit, Jess!!! I would pick the pink peplum top. So adorable! Love the jumpsuit on you! Love the bailey peplum top! Love the coral caroline chevron top! the bohemian rhapsody maxi dress! I love the harlowe maxi dress! I love the Kate dress! The London top is cute! The Caroline Chevon top in coral is fabulous! Great giveaway! I must have all the chevrons! You are looking great! The Phoebe top is adorable! Have a great weekend! I have been on the hunt for a black jump suit for a while..so I would totally pick this! Woohoo for a giveaway! I really liked the Pearl dress in mint! I like the Dakota Dress! I love the pearl dress!! I'm digging the Islands dress! I loved the pandora leopard dress!! Absolutely love your jumpsuit! You look gorg! I love the Gabriella shoes in green! I like the Capri Maxi Dress! I love the delaney maxi dress! I love the skylar maxi dress! Loving the mint chocolate chip maxi dress. You look so cute in this jumpsuit. Plus, it looks super comfy! Bonus! I hate that I will be out of town for the meet up next week. I hate I won't get to meet some of the girls of the SBS. Please send my reguards. Hope I can make it to the next one. I love the anchors away top!! I love the Emmy dress. I love the jumpsuit! You look amazing! My favorite item is the Quinn Top! Hard to pick just one! I love the sheer chevron blouse, and some of those maxi dresses are a close second. I am loving the alexandra tunic, the capri maxi dress, the saturday night jump suit and the skylar maxi. all perfect summer items! I like the Emmy Dress! I'm really loving these Gabriella in almond shoes! Sorry, but this one is only open to US readers. I hope you get to enter the next one!! Hard to choose just one fave, but I do love the delaney maxi dress! I adore the brooklyn cardi! They have amazingly good taste! I can honestly say I would wear every item they have for sale, and that is highly unusual for me! I love the Olive Tank Top! The pearl dress in mint is my favorite! Love the dresses! Hard to choose a favorite! The emmy dress and pearl dress in cream are really pretty! LOVE the Cosmopolitan Wedges in Black!! I have been "window shopping" on this site for months! I LOVE SO many pieces in their shop. Everything there is exactly my style! Their cha cha top is my favorite! !